​Martin Gettings: “We use sustainability reporting to keep our stakeholders informed on the actual activity we do as a business – to communicate it loudly and transparently and through this, we aim to inspire our people, peers and partners to come together to make sustainability real." How has reporting helped Canary Wharf form its approach to sustainability? “Sustainability reporting has helped with prioritization and focus on both reporting and action. Assessing our material issues for the purpose of reporting helped us realize that both our own priorities and those of our stakeholders lie within the activities and impacts of our core business. For instance, creating vibrant communities is at the heart of our mission and is fundamental to our stakeholders, making this one of our most material issues. Could you tell us a few examples of Canary Wharf’s major sustainability impacts? 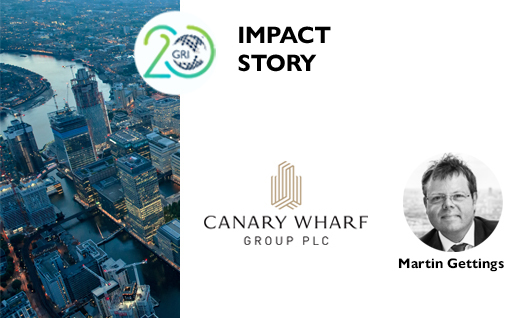 How does sustainability reporting connect with Canary Wharf’s commitment to the UN Sustainable Development Goals? What is your vision for the future in terms of sustainability and reporting? With the GRI Sustainability Reporting Standards, companies are able to unlock the transformative power of transparency, while contributing to the sustainability agenda and increasing trust. Click here for more impact stories from GRI's network.